The holidays are here, and the season of eating has begun. How do you stick to your healthy lifestyle and still enjoy a holiday table laden with sweet potatoes, pasta, and your mom's homemade dinner rolls? You eat them, of course. When you eat food containing carbohydrates, the digestion process starts in your mouth so you receive immediate energy. When you are exercising, carbohydrates replace your energy stores so you can have an effective and efficient workout and avoiding "hitting the wall" we all dread. 2. Improve your long-term health. Sustaining a long-term, low-carb diet is extremely difficult. Yes, it works for weight loss, but as soon as you return to your old diet, you gain back the weight you lost. Or, you follow a low-carb diet for awhile, then fall off the wagon, then return to a low-carb diet, and so on. This yo-yo effect wrecks havoc on your metabolism, and the continual return to a restricted, high-protein diet can cause serious damage to your organs and overall health. 3. 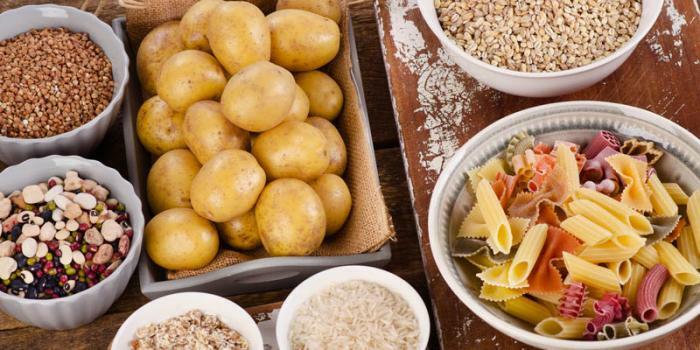 Reap the benefits of the right carbs. While it's wise to avoid sugar and white flour carbs carbohydrates, which have no nutritional value, there are plenty of others you can (and should) consume. Stick to those that are nutrient dense, including whole grain sprouted bread, brown rice, sweet potatoes, lentils and beans, plain yogurt, oatmeal, veggies, and fruit. Consume portion-controlled healthy carbs along with lean protein and healthy fats to lose weight or to add more fiber and nutrients to your diet. 4. Boost your mood and mental sharpness. Foods that contain healthy carbohydrates promote the secretion of serotonin, a brain chemical that helps maintain mood balance and promote healthy sleep. Carbohydrates are fuel for your brain, so if you don’t eat enough of them, you are negatively affecting memory and mental clarity. Low-carb diets are usually high in protein, and high-protein diets can cause kidney damage from uric acid and calcium oxalate stone formation. Excessive protein intake, especially from animal sources, also increases calcium loss in urine, which can contribute to osteoporosis. New dietary guidelines recommend the consumption of a plant-based diet, and it’s almost impossible to eat a vegetarian diet without carbohydrates. The American Dietetic Association recommends that carbohydrates make up 40-50% of your daily intake. If you are cutting out multiple food groups to reach a goal, it’s probably not the ideal diet, and if you can’t sustain your nutrition plan, it’s not a healthy lifestyle change. Aim for a balanced diet of healthy carbohydrates, protein, and fats, together with less sugar and processed foods. And allow yourself some cheats in moderation for a successful long-term nutrition plan. It is the holiday season, after all.